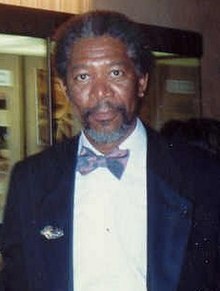 Morgan Freeman (born June 1, 1937) is an Afro-American actor and movie producer. He is also a beekeeper. Freeman was born in Memphis, Tennessee on June 1, 1937. He started acting when he was nine years old in a school play and at age 12 won a drama competition in his home State. Morgan worked many acting jobs until 1968 when he got his first role on Broadway in a Musical called Hello, Dolly!. He is known for his soft-spoken voice. He has donated several amounts of money to the Democratic Party. Once he stated that "Republicans scare me." ↑ Caitlin McDevitt (June 20, 2012). "Morgan Freeman: Republicans 'scare me'". Politico. This page was last changed on 17 August 2018, at 04:28.